"I'm trying to upload a video file to YouTube with 76 MB. But it says that this video is too big to upload. Actually, I was able to upload a video that was 129 MB without any problems. And I am so confused about YouTube video size. Could you illustrate it to me or tell me how to compress video files?" "I made some videos for YouTube and they are all under 10 minutes. But it tells me that the file doesn’t fit when I try to upload them. What is the best size for uploading video? And is there any way to make the file smaller?" A majority of people have come across the similar puzzle as above when uploading their personal videos to YouTube. It is true that YouTube makes a strict limit on YouTube video file in order to standardize all uploading videos. It is necessary for the newbie to know the details of YouTube upload size before calling YouTube videos uploading begin. Generally speaking, uploading video of YouTube is limited under 15 minutes and less than 2GB. Users are allowed to upload videos up to 12 hours in length if they have a good track record of complying with the site's rules and verified their account through a mobile phone. At the same time, if you adopt the up-to-date browser, your uploaded video may be larger than 20 GB. Through you ought to pay attention to your video size (file dimension, duration), need to remind you that you can't ditch away your video quality. Imagine if you are also the YouTube watcher, can you bear the lousy video quality with obscure image and unarticulated sounds? I bet you not. So it's advisable for you to lay a good balance between your video size and your video quality. Sometimes, although we clearly know the video size determining factors, we still can't impose a restriction on video file while shooting video. To ensure video's integrity and effect, when facing the larger video file, users should figure out the way to reduce video rather than cut some video plots. Thus, we summarize some available ways for your consideration to make your upload video suitable for YouTube. For Mac OS X users: iMovie, the member of big Apple family, is the best free video editing software which enables Mac users to effortlessly shrink YouTube file size. Of course, the operating procedure is easy to handle. But it can't support all the file formats. So before you decide to apply it to compress your YouTube videos, you need to know the best formats iMoive supported at the first place. For Windows OS X users: Similar to iMovie, Windows users also are asked for installing a useful video size reducer. Commonly, Windows Movie Maker is the most welcomed video editing and creating app especially for who usually upload his personal video to YouTube or facebook for sharing. And before you start to downsize video, you should download and install this app free on your computer. The aforementioned two free video apps are widely used nowadays because of their functional video editing feature. But they are not experts in compressing YouTube video size so that people have to find their alternatives. 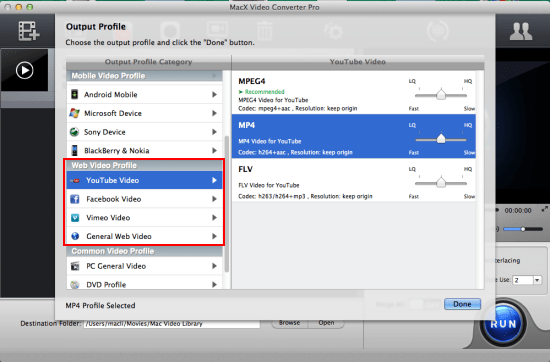 At this point, video converter like MacX Video Converter Pro will enter your sight on account of their outstanding video conversion function. Designed for both Mac and Windows users, it is capable of compress lots of HD and SD videos to MP4, FLV, AVI, 3GP, etc video formats supported by YouTube. Moreover, this helpful video file size reducer which can allows users freely adjust video parameters including resolution, frame rate, aspect rate and more so as to easily upload HD &SD video to YouTube. Now, follow the next steps to shrink video. After the video converter for Mac is downloaded, installed and run on Mac, click "Add File" button to load the video file you want to compress. Choose the best video format for YouTube like MP4, AVI or FLV as the output format in order to normally upload to YouTube. Note: In this step, you can feel free to reset the video parameters in order to make you video well match YouTube video size. And decreasing resolution is pretty important. Click the "RUN" button at the lower right corner of the interface to begin converting video. Beyond video file size limits you should care about when uploading video to YouTube, there are also scads of other YouTube upload limits you are required to cope with, for example, YouTube uploading contents (no adult videos or unhealthy videos), video quality (bit rate/sample rate/resolution), video formats accepted by YouTube or not, etc. Wow! So many limits YouTube draws up. And it would be tough to confront so many annoying YouTube limitations. Fortunately, with this Swiss Army Knife in hand, you can hassle-free upload your whatever video to YouTube in a flash, for this all-round video converter can aid you to deal with all the limits YouTube lay down like a cork. Not buying this? Just give it a test!